We showed appreciation to our guest, Sridhar Sankaran for his efforts in collecting over 200 pairs of eyeglasses. Great job, Sridhar! 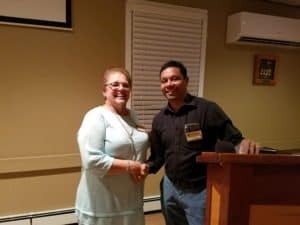 President, Ram Penumarthy, accepted the MLERF Appreciation Award on behalf of the Easton Lions Club for outstanding and continued contributions. We thank all our club members for their continued efforts through many activities that resulted in getting these appreciations and accolades. Lions members, Nancy Sullivan & Marilyn Henderson, were recognized and awarded the Silver Centennial Award. 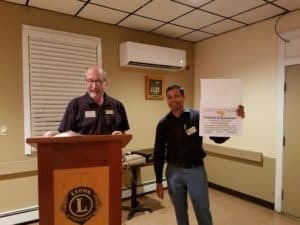 This award was given for sponsoring and retaining new members during Centennial Celebration, which marks 100 years of Lions serving our communities. Well done! Matt Cioffi, presented the By-Law Amendments that the Board of Directors recently approved. Scot Kudcey, Golf Tournament Chair, gave an update on the 20th Annual Golf Tournament which will take place on Monday, September 24th 2018 at 11am. Jon Morgan announced that planning for the Holiday Festival has begun. Please contact Jon to help organize the 32nd Annual Holiday Festival. Secretary, Matt Soeldner, gave information on the upcoming Blink of an Eye Walk which helps raise money for Mass Lions Eye Research. He also reiterated that help is greatly needed at the Thrift Store – please come down on Wednesdays & Saturdays to lend a hand. Treasurer, Ken Love, presented a riveting treasurer report. To join in on the fun and learn more, please attend our next meeting on September 26th at 6:30pm.